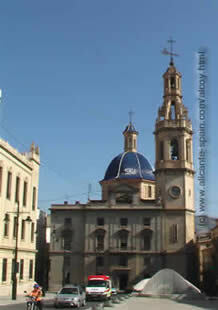 For most tourists the city of Alcoy in the interior of the Costa Blanca will be little known. With its crossing of five different rivers (most of them with little water), Alcoy has a special charm.With the rivers Serpis, Uxola, Molinar, Bnisaido and Riquer, all crossing Alcoy, it is full of impressive bridges and viaducts. Being mostly an industrial town, Alcoi like it is called in valencian, is best known for its famous fiesta of the Moors and Christians. It takes place around St George’s Day at the 23rd of April. 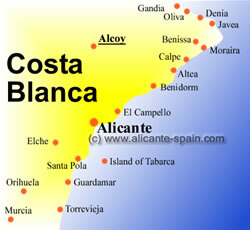 The celebrations take several days and are the most famous around the entire Costa Blanca. If you have a chance to see it, mark it red in your calendar, it’s an absolute “must see” for every tourist and local. In case you happen to be around another time of the year, Alcoy itself is worth a visit and got lots of sightseeing places to see. Especially the Plaza de Espana with its city hall (from 1861) and the church of Santa Maria.Around the corner of the city hall building in the street of San Lorrenc you find the office of the tourist information to catch a free map. 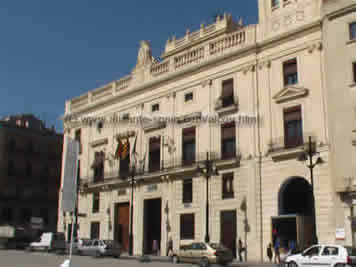 Just next to the plaza you can follow the indications to the bridge of San Jordi. 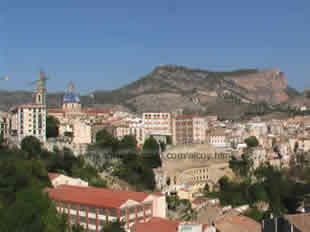 Right at the beginning of the bridge turn left into the street of San Miguel where the archeological museum of Alcoy is situated. On display various findings from the roman and iberian time. (Open Mo to Fri 9 – 14 ; Sat. 10.30 – 13.30h ). For those of you who can’t make it in April to see the impressive celebrations of the Moors and Christians, here’s a little tip. Have a look and visit the museum de fiestas, which is located just opposite of the archeological museum in the Calle San Miguel. Lot’s of lovely decorated historic costumes and pictures of past fiestas will give you a little impression, why everybody around the Costa Blanca talks about Alcoy when it comes to the biggest celebration of moros y christianos. Visiting Alcoy during the hot summer months (which is most of you might do), can be a bit stressful. Especially the city center is often crowded by many cars and after some hours walking around, you might look for places to rest. Around the old town city centre many little bars and cafes are inviting you for a short break. If you look for a little more peaceful area, walk up the Sant Nicolau road and you will find two lovely gardens: the “la glorieta” and the “parc de cantagallet”. I really enjoyed these green spots after hours of walking around in the busy city.